There’s something special about the Shabbat/Christmas/Chanukah combo, maybe even a little miraculous (see below). On Friday afternoon, as we were doing last minute grocery shopping, hurrying home to cook, and generally feeling festive, so was everyone else. Christmas is really when non-Jews understand what it’s like to host big Shabbat meals. Though it’s hard to take myself seriously when I describe an 8-person dinner as very small and very casual. Well, at least I succeeded on the casual part. And “small” is all relative, right? And as small and casual as it was, somehow we were still scrambling at the last possible moment before Shabbat started to finish cooking the food, light Chanukah candles, light Shabbat candles, set the table, shower, feed Aliza… But it was all good, or at least good enough. Put it in the crockpot on low for 6-8 hours, or in a pot on the stove for 45 minutes or so. It’s super flexible, and it’ll be good pretty much no matter what. Don’t try to prove me wrong. Naomi helped out with Aliza in the morning so we could sleep some more, and Josh hosted another small, casual meal for Saturday lunch, and it was just perfect. Any perceived food problems were irrelevant, there was an amazing ginger miso dip, my salad made another appearance, everything else was delicious, there were sufganiot (Chanukah donuts) and chocolate covered pretzels, and we talked a lot about Harry Potter. And next week…we come full circle. Back to New Year’s Eve, which is when this whole thing started. And, just a little preview: there’s gonna be a dinner party. And a lunch party. I can’t wait. 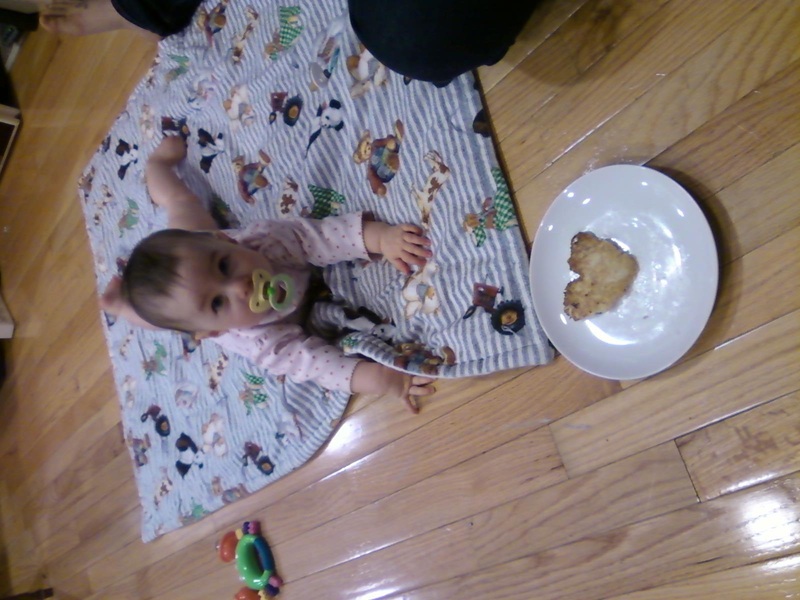 But first, Aliza and a little Chanukah love, thanks to Emily’s latke artistry. I knew it was a good Shabbat when I had 3 different dinners to go to Friday night. And I actually made it to all of them. From there, it was home, where I actually ate a meal. 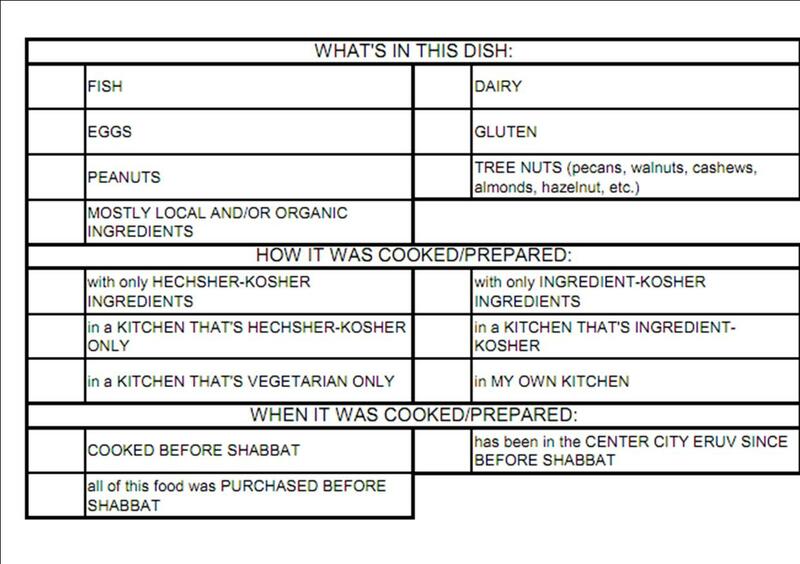 My parents were in town for Shabbat, and they put together most of the dinner while I was out making the rounds. We had leftover rutabaga apple soup that Ruchama and I had made earlier in the week, tuna patties, spinach, and vegetable kugel (more on that in a bit). Aliza managed to cry her way out of her crib, so she joined us for dinner, too. So that’s 3 dinners. And 1 of the potlucks. Potluck 2 was at Minyan Tikvah on Saturday. After our first sticker experiment a few months ago, we revised the procedure, and though we still have a few kinks to work out, this was definitely an improvement, and, as is to be expected, no one went away hungry. My family’s potluck contributions were a lemon-mint chip ice cream (made by Marc, of course), a no-bake chocolate mousse pie from my mom (made possible by the borrowed cool whip), and, here it is again, the rest of the vegetable kugel from Friday night. When I was a little kid, I got sick a lot. Like, really, a lot. And pretty much each time I was home sick, my dad would rent a VHS tape of a movie musical (usually Singin’ in the Rain), and we’d watch that and make a potato kugel. But somehow, I never really learned how to make the kugel. Maybe something to do with being 5-9 years old and congested every time I saw it made. Even with my dad’s recipe in front of me, it’s just never worked out. So I took the opportunity of having my parents in town and no other food plan to speak of to learn firsthand how to make this childhood favorite. Even with the addition of other veggies, it somehow tasted just like I remembered. Peel and cube the veggies except the onion, and process in batches in the food processor. Move to another bowl. Combine the other ingredients in the food processor and give it a spin. Mix it all together, pour into a greased large rectangular pan, and bake at 350 for an hour. Though it will actually need longer than that. 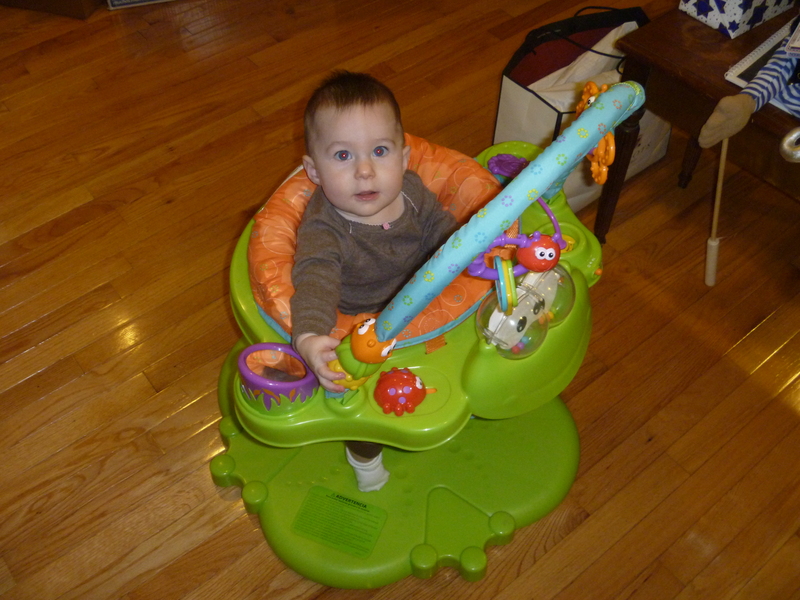 In other news, Aliza seems to be adjusting to her new teeth, just in time to enjoy an early Chanukah present. Check out this awesome frog! One of the first chana masala recipes that Marc and I ever tried to make said that by cooking the chickpeas for a long time over low heat and gradually adding water, the chickpeas would become “toothsome.” We wondered what that meant, we joked about it, we quoted it, but we didn’t really understand the impact of “toothsome” until this Friday night, when, while 20+ people ate chana masala in our living room, we were upstairs comforting Aliza while she experienced her first teething pains. Toothsome indeed. 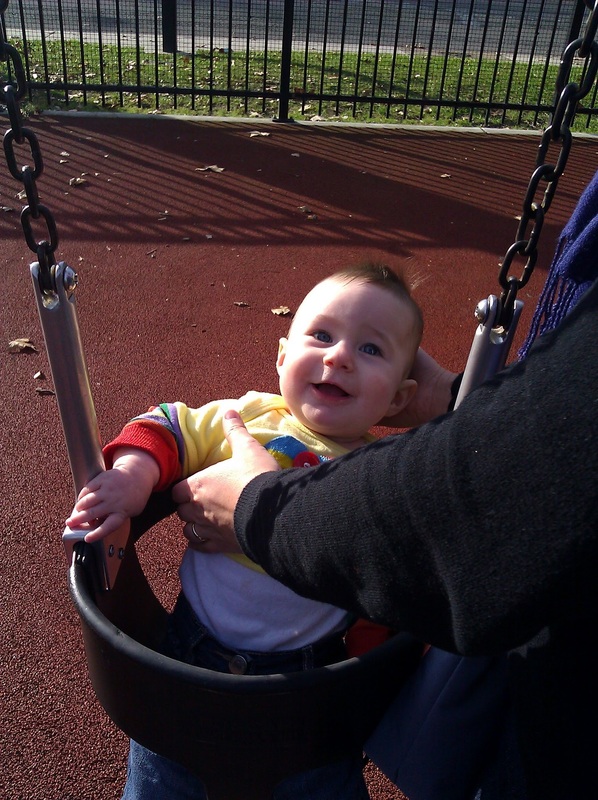 I was really moved by the beauty of having services in our living room, and when I took Aliza upstairs to put her to bed, I thought about how incredibly lucky she is to have be born into such a truly wonderful community, and to be able to fall asleep to the sounds of friends davening downstairs. The potluck fare was plentiful and varied, though I only really remember that my chana masala didn’t taste like I wanted it to. (Sleep deprivation = tunnel vision.) I’m not going to include a recipe, but I have three more weeks to perfect my craft, and I should remember to use tomato paste and ginger ale next time. I also recall eating some nutella tart yogurt off of a paper plate and ripping off a corner of the plate to use as a spoon. And I may have said something about my skill with opposable thumbs. During dinner, Marc and I spent about 20 minutes in Aliza’s room while she screamed louder and scarier than I’ve ever heard out of her, and then spent the rest of the night taking turns going up and down the stairs to check on her/comfort her. I will also admit to calling my parents not once, but twice, during the fiasco, and then daydreaming about Aliza calling us in 30 years asking for similar advice. With sincere apologies to anyone who wasn’t there, my favorite part of the night was the bitter end when only a few people were left, we started drinking peppermint mocha Kahlua, and Aliza was finally asleep. That didn’t last long, though, and while we had a tough night, and didn’t clean up as much as we should have before going to sleep, I stumbled downstairs in the morning, found Oreos and Alex’s fig cake still on the coffee table where we left them, ate some of both, fell asleep on the couch with a baby on my chest, and was glad things are going the way they’re going. Sleep deprivation and all. We must have eaten on Saturday, but I don’t recall. I do know I was in my pajamas until 5:00, that I sadly missed Ariel and Eric’s aufruf, and that Sara paid us a lovely visit. 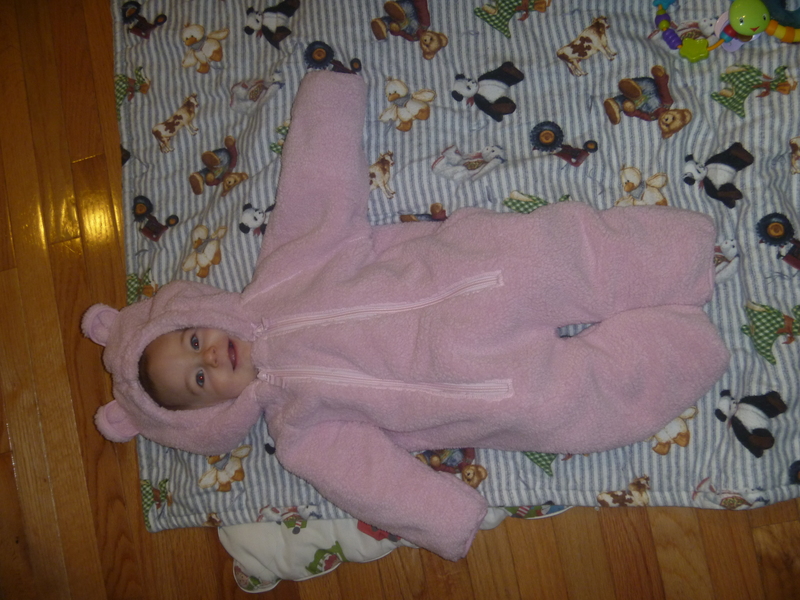 And, on Friday, I got this incredible picture of Aliza in her pink bearcub best. Shabbat starts and ends really early these days. We’re talking 4:18 on Friday afternoon and, by my imprecise calculations, 5:18-ish on Saturday. That means Friday afternoons in the winter are typically a flurry of crazy until candlelighting, and then a drawn-out haze until dinner. But this week, even with a big work event, everything got done on time, and I didn’t have the panic. I didn’t miss it, exactly, but I also felt like that must mean I was doing something wrong. But no, it was just a super smooth afternoon sliding right into Shabbat. Ahhh. And then, Friday night, another really amazing thing happened: the Grad Network held its first ever Kabbalat Shabbat services. And people came. A lot of people. We were hoping for a minyan (a minimum of 10 adults), and ended up with 38. It’s a real testament to a lot of things I’m really proud of that this happened and that I had almost nothing to do with organizing it. And, services being followed by fleishig (meat) Chinese food didn’t hurt matters either. Though I am still a reluctant and somewhat embarrassed meat eater, the food was just really seriously good, and hard enough to come by in Philly that some people showed up for the food and were, I think, pleasantly surprised by the caliber of the company. The vegetarians, though, to be fair, probably showed up for the company and made do with the food. Next time we’ll make sure there’s tofu. Saturday afternoon, Ilana hosted a bunch of Tikvah-affiliated folks to talk about the recent Hadar Minyan conference (am I even allowed to use the word ‘affiliated’ in this context?!). Since Marc and I didn’t go to the conference this year, it was great to hear reports from others who were there. And Ilana made awesome crockpot chili. And I had my first peppermint Jo-Jo of the season. The other part of dessert was a concoction Marc dubbed “yo-milk surprise.” Special shout-out to Williams-Sonoma for replacing our ice cream maker with no questions asked! I wasn’t around for the ice cream making, but I hear it went something like this: the corner store didn’t have cream, so milk and yogurt went into the ice cream maker along with m&m’s that then lost their color, turning the whole slurry the color of hospital walls, which Marc then tried to improve with food coloring. It tasted surprisingly good, but I’m not sure it’s a recipe we would try to recreate on purpose. At lunch, Josh, the most calendrically-minded person I know, helpfully pointed out that 2011 is one of those years where there are actually 53 Shabbats, making the title of this whole deal, well…. That just means I have four more weeks to go, instead of three. And after that, dear readers, it’s your turn! You’re all invited to be part of 25x52x2, that is, the next year of this project. I hoped all along that this blog would inspire people to host Shabbat meals of their own, and I’m really hoping that if you sign up to write about your Shabbat experiences for a week, that will provide both an inspiration and a pretty direct motivation. You certainly don’t have to host to write, but it’s something to think about. 3) Include a photograph of food or something else related to the experience. a) You don’t have to live in Philly to be part of this. b) You don’t have to invite me to your meal(s). c) But you can if you want. I’m a fun guest. And I come with a good-looking entourage. d) You don’t have to be observant in any way as long as you have something to say about Shabbat. And food. e) I want there to be a way for non-Jews to write, too, so I’m open to ideas. f) Check out the Sabbath Manifesto for inspiration. Also, I just started reading “The Sabbath World,” and my overwhelming emotion so far is that I wish I’d written this book. g) I will plan to fill in on weeks when no one signs up, but I want to limit how often that happens. h) So sign up. Tell your friends and other interesting people you know to sign up. It’s going to be a Shabbat blogging blogosphere. Maybe we’ll meet each other and expand who we invite to our Shabbat tables. Maybe we’ll have a big party next New Year’s with everyone who contributed. Maybe I’ll learn a recipe that will change everything. Maybe other awesome stuff will happen.